Is there any way to disable the "End Game" function, but then still allow the player to save when they die (Or at least save somehow)? The only way to disable the F6 end game function is to check the quest rule that goes straight back to the main menu when you use F6 or die. I'd highly recommend against this, however, as you'd need to use save points and you would lose any progress on dying. Edit: "Against" is an important word to forget. Yeah, I tried that before and I agree, it wouldn't work well. I'm trying to link d-maps together without the player being able to go from d-map 1 by teleporting. For example say you work your way through d-map 1, then to 2, then to 3, I don't want the player to be able to get back to 1 from 3 by simply clicking "end game" and then continue, warping them back to the first screen of d-map 3, walking one screen to d-map 2, ending game again and warping to the first screen of d-map 2, then just walking into d-map 1. I want them to have to walk from d-map 3, through 2, and end up back in one. I hope I explained that well. Is there any way to do that and still be able to save normally? 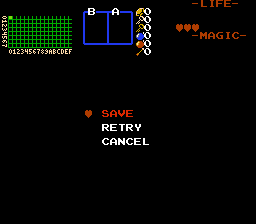 No you won't be able to save normally, but there is a save point combo type. Just like russ said its gonna make dying punishing. Edited by Avataro, 23 February 2018 - 07:08 AM. Err, I could give you a simple script that allows saving on death before exiting the game, if you want that option. It's compatible with the No-F6 quest format. What about adding +1 to death counter and auto-saving on any F6? Wasted that valuable potion or superbomb? Mwahahaha! Edited by Alucard648, 23 February 2018 - 08:31 AM. No, you cannot disable the end times. The coming entropy apocalypse cannot be stopped. We are helpless to stop the death of everything. I changed the hardcoded Link sprites to use a sparkle lweapon. I'll need to set the first weapon to loop a few times, so that it doesn't waste tile space. I think that I can reset its deadstate to accomplish this. Next, to-do: Complete string and cursor menu code. Thanks for the help everyone. I'll definitely check out the script Zoria, thanks. const int SFX_WINKOUT 			= 38; //Sound to play during wink-out animation. const int SFX_LINKDEATH 		= 28; //Sound to play when Link dies. const int SFX_GAMEOVERSCREEN_CURSOR 	= 6;  //Sound to play when the player moves the game over cursor. const int SFX_GAMEOVERSCREEN_SELECTION 	= 44; //Sound to play when the user selects a game over menu option. const int MIDI_GAMEOVER 		= -4; //MIDI to play on Game Over screen. const int END_DEATH_SPIN 	= 40; //Frames to display death spin animation. const int END_WINKOUT 		= 10; //Frames to display wink-out animation. const int TILE_SAVECURSOR_CSET 	= 1;    //CSet for minitile cursor. const int DONT_SAVE_X 		= 102; //X position of the RETRY string. const int SAVE_X 		= 102; //X position of the SAVE string. const int DONT_SAVE_Y 		= 68;  //Y position of the RETRY string. const int SAVE_Y 		= 54;  //X position of the SAVE string. const int CURSOR_OFFSET 	= 26;  //X offset of the cursor from the text. const int MENU_SEL_STATE 	= 0; //The current selected menu option. const int MENU_SEL_POS_X 	= 1; //Stores where to draw menu selector. const int MENU_SEL_POS_Y 	= 2; //Stores where to draw menu selector. const int DEATH_LX 		= 3; //Cache of Link's last X position before death. const int DEATH_LY 		= 4; //Cache of Link's last Y position before death. const int DEATHFRAME 		= 5; //Timer for death animations. //Normal pre-waitdraw functions go here. //Put any health refull code above this! //Normal post-waitdraw functions go here. //Set game music to a silent MIDI. //Global scripts DO NOT LIKE to block the active subscreen! 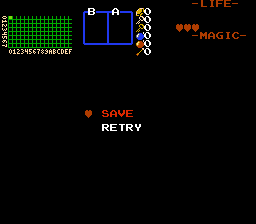 //spin Link around by drawing his tiles, then make the wink out. For whatever it is worth, I also made an expanded version in 2.55, with a fully-scripted F6 Screen. Note that the quest has the No F6 rule enabled, but you can still read the F6 key with scripts. You can view the script for this if you are curious; or download a demo quest for it. It requires ZC Necromancer (2.55 Alpha 1-p16, or The 2018 PureZC Fall Expo Build or later) to play. Maybe I'm mistaken, but can't this be done with screen flags of some sort (I'd have to jump into ZC and check it out)? I think you can set ZC to remember the room you entered the dmap on and set the continue spot there, so walking from dmap 3 to dmap 2 then F6-ing out would have them continue at the end of dmap 2 rather than the beginning. Again, I could be wrong here.